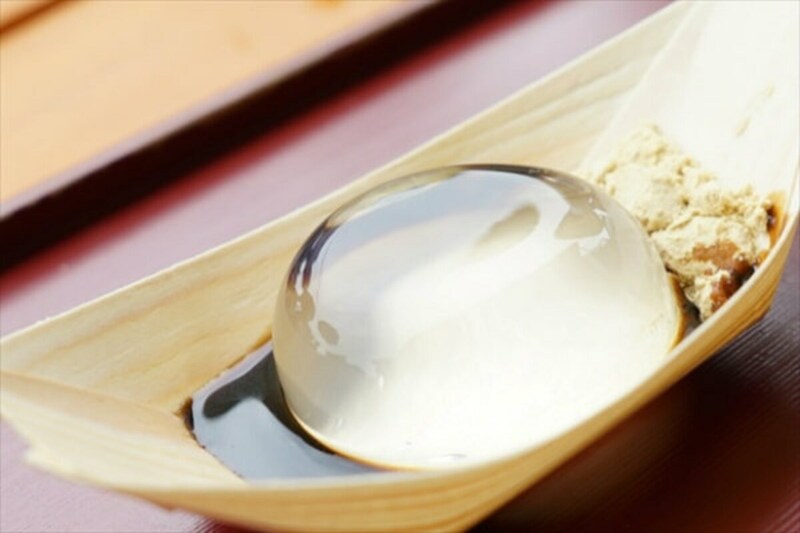 Mizu Shingen Mochi (Water Shingen Mochi) goes by a variety of names overseas, including “Raindrop Cake." Originally it was a take on a traditional Japanese sweet called shingen mochi, which is a famous specialty of Yamanashi Prefecture. But now, it's the latest addition to the ever-increasing line of specialty Kit Kat flavors! While the Raindrop Cake is made from solidified water, traditional shingen mochi is made from gyuhi, a soft form of mochi rice cake. However, both the Raindrop Cake and the shingen mochi dessert are served with a generous portion of kinako soybean powder, and topped off with brown sugar syrup. This delicious combination of flavors is incredibly popular with people around Japan, and visitors to Yamanashi always keep an eye out for a brand called Bellflower Shingen Mochi, made by Kikyouya, which was founded in 1889. Easily identified by its red-and-white packaging (that actually has a bellflower on it), the beloved Bellflower brand is so popular it’s even collaborated with 7-Eleven in the past for a limited-edition ice cream. Now the famous sweet is teaming up with another famous name in the confectionery world, as Nestlé Japan has just revealed that their next Kit Kat will feature the flavor of Bellflower Shingen Mochi. According to Nestlé, the new Kit Kat contains Bellflower’s glutinous rice flour, kinako soybean flour and brown sugar syrup kneaded into the wafers, while the flavor of the shingen mochi itself is blended in with the chocolate to create a unique taste unlike any other Kit Kat flavor! While Nestlé is known for making exclusive local Kit Kats only available in certain prefectures around Japan, this new variety is the first local Kit Kat flavor exclusive to Yamanashi Prefecture. Available at the Kikyou online store, and at highway rest stop retail areas along Yamanashi’s Chuo Highway, each nine-piece pack is set to retail for ¥780 (US$6.85).